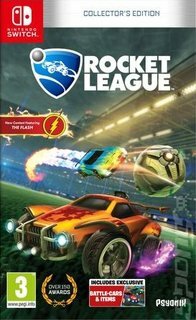 Rocket League presents players with a sport that, alas, will probably only ever exist on games consoles (and maybe the odd episode of Top Gear). It's basically football, the beautiful game, writ large. Except instead of players, you have cars. How's that for a twist on a tried and tested sport? Using an advanced physics system, the game depends on mass and momentum to lend players an intuitive sense of how to make this frantic game work. The basic controls are pretty simple, but mastering Rocket League takes a sophistication that belies its simplicity. The action is fast, hard and brutal. This boxed release features an all-new season mode that offers players a meaty single-player experience. The core, though, is arguably the fast-paced eight player online mode with a variety of different team sizes and configurations to try out. That said, in a move that's increasingly rare these days, developer Psyonix has built a split screen mode that can be played locally or taken online so that you can give your mates a sound thrashing too. With extensive Battle-Car customisation (that offers more than 10 billion configurations!) and unlockable items and vehicles, there's plenty in Rocket League for players to sink their teeth into!